Beverage Dynamics is the largest national business magazine devoted exclusively to the needs of off-premise beverage alcohol retailers, from single liquor stores to big box chains, through coverage of the latest trends in wine, beer and spirits. 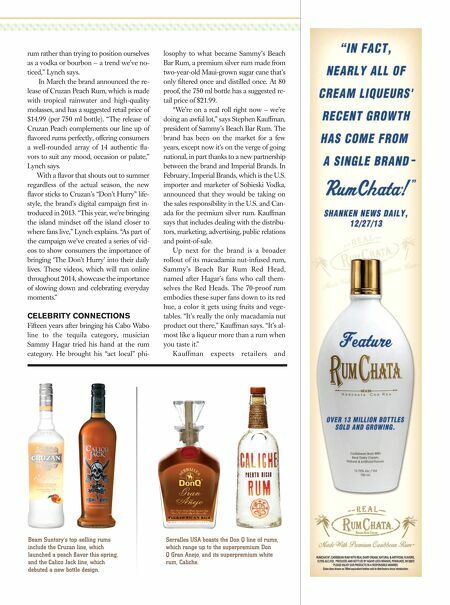 18 Beverage Dynamics • July/August 2014 www.beveragedynamics.com RUM MAGIC Captain Henry Morgan raided Fort Lorenzo and ultimately cap- tured it. "Captain Morgan 1671 Spiced Rum is our way of paying homage to our brand's namesake and the date he lost his treasured fl agship," Herbst says. That commemoration even appears in the product's packaging: a jug designed in 17th century styling. At 70 proof, the 750 ml bottle retails for $19.99. Admiral Nelson Rum has only been part of the Heaven Hill Dis- tilleries' family since 2011, but that's all the more reason its packag- ing received a makeover last year. "We have seen an opportunity to elevate the brand, make it a little bit more premium in feel for the consumer," says Hannah Venhoff, brand manager for Heaven Hill's rums. The new bold, clean style makes it distinguishable on the shelf and matches its recognition as the second largest spiced rum and one of the top 10 rums in terms of overall case sales. That nautical styling appeals to spiced rum consumers as it echoes throughout the segment. "Calico Jack is very nautical-fo- cused with an edgy pirate, which resonates strongly among spiced rum consumers," Lynch says. Positioned as Beam Suntory's primary player among spiced rum, the brand has unveiled a new look. "We also recently updated our Calico Jack packaging to not only play up the nautical element of the brand, but also elevate the brand's overall look on shelf," Lynch says. While Admiral Nelson is a major value player in the spiced rum segment, Heaven Hill's other rum, Blackheart, appeals to a more pre- mium-minded crowd. "We have continuously seen incredible growth with this brand year over year," Venhoff says. "We were up about 19% nationally in 2013 and we continue to see that volume growing." NEW VENTURE Captain Morgan made a name for itself as a leader among spiced rums. "We introduced a limited-edition Sherry Oak Finish Spiced Rum last year, our fi rst ever White Rum earlier this year and now a limited edition 1671 Commemorative Blend Spiced Rum," Herbst says. "Consumers have responded extremely well to these variants, which makes us very optimistic about the future." In February, the brand released its fi rst white rum, Captain Morgan White Rum that is 80 proof and the 750 ml bottle retails for $15.99. It is also available in 50 ml, 200 ml, a 375 ml fl ask, 1 liter and 1.75 liters. "Captain Morgan White Rum — Diageo's largest innovation to date — launched in January and can be purchased throughout the U.S. Our marketing efforts for Captain Morgan White Rum began in February," Herbst explains. Diageo has supported the launch with a print ad in Sports Illustrated's 50th Anniversary Swimsuit Edition as well as television and online advertisements, point of sale materials, and digital extensions. FLAVOR FACTOR Category leader Bacardi is no stranger to fl avored rums. The com- pany revolutionized the category nearly 20 years ago when it launched the fi rst fl avored rum, Bacardi Limon. The newest addition to its fl avored rum portfolio, Mango Fusion, was introduced in April as a one-of-a-kind fl avor that fuses mango with orange. "It offers a light mango fl avor with a recognizable hint of orange that creates an unforgettable taste experience," said Kelly Adams, brand director for Flavored Rums. The release has been supported by national digital media as well as sampling and promotion in the on- and off-premise venues. Avail- able in 50 ml, 200 ml, 375 ml, 750 ml, 1 liter and 1.75 liter sizes, the 750 ml bottle retails for $14.99. With 22 expressions, including 13 fl avors, already under its label, Beam's Cruzan Rum managed to add yet another innovation. 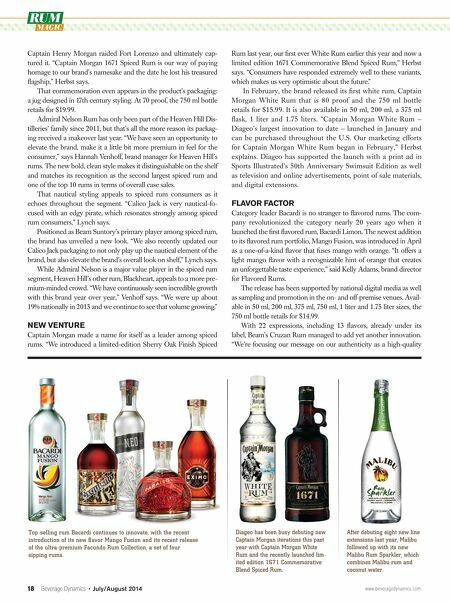 "We're focusing our message on our authenticity as a high-quality Diageo has been busy debuting new Captain Morgan iterations this past year with Captain Morgan White Rum and the recently launched lim- ited edition 1671 Commemorative Blend Spiced Rum. After debuting eight new line extensions last year, Malibu followed up with its new Malibu Rum Sparkler, which combines Malibu rum and coconut water. Top-selling rum Bacardi continues to innovate, with the recent introduction of its new fl avor Mango Fusion and its recent release of the ultra-premium Facundo Rum Collection, a set of four sipping rums.